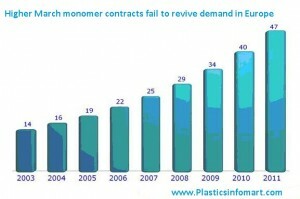 In Europe, March monomer contracts settled with increases over February levels for propylene, ethylene and styrene. These increases were in line with the higher spot market levels witnessed during February, especially for ethylene and propylene. March propylene contracts settled €55/ton higher on the back of the higher naphtha costs as well as the €50/ton increase in the spot market observed during February as per the pricing service of ChemOrbis. There were also ongoing concerns about supply constraints stemming from several cracker turnarounds in the region. Ethylene contracts also settled up €50/ton from February due to the firmer spot naphtha prices. Plus, spot ethylene prices gained €30/ton during the course of February and triggered the rise in the contract price. Looking at the styrene market, March contracts settled with a €27/ton increase as the upstream benzene contracts for March settled also with increases of €14/ton from February. However, the spot styrene market softened by $10/ton during February given the $30/ton softening on the spot benzene market. Higher monomer settlements coupled with supply constraints in Europe give an upper hand to sellers to raise their polymer prices but weak demand, which higher monomer contracts failed to revive, still persists in the market. Buyers in Italy appear to be adamant to pay only small hikes while sellers are insisting on obtaining at least the monomer contract hikes. In the PS market, sellers are asking rollovers to up to €20/ton increases on their spot transactions, below the €27/ton hike in the March styrene contract in order to be able to entice better buying interest amidst slow demand. A distributor commented, “We are asking €20/ton increases for March although our West European supplier is officially aiming for €40/ton increases. We do not want to push away our customers since we already struggle to achieve deals. March has started on a slow note in terms of buying interest and we already lost some possible deal connections as some other sellers were offering at more competitive prices.” The distributor expects to close their March business by the third week of the month since it will be a shot month due to the Easter holiday. A buyer received €15-20/ton higher PS offers when compared to February levels and added that he is still evaluating these offers as he hopes to see lower prices in the days ahead since overall demand is not good enough to support increases according to ChemOrbis.